My husband and I have two very different approaches to the fine art of hanging wall art. His approach involves tape measures and levels, measuring and re-measuring, tapping the wall for studs and then some more measuring just to be sure. The only problem with eyeballing it is that once in a while I'll be just a little off... you know, just like a smidge. Those "smidges" don't bug most people but me, I take out the nail, move it a smidge and hammer it in the perfect spot. If it's just a smidge off I'll always look at it and be like... "oh that picture, it's just off a smidge, it's driving me nuts!!" Whenever my hubs gives me that how did you do that? look I'm always secretly hoping he doesn't take the picture off the wall... if he did he would be surprised to see one (sometimes two!) extra not so pretty little nail holes in the wall just a smidge from the nail. Sorry honey! But hey, I'm always close, only miss by a smidge... that should count for some kind of natural talent. This particular issue had an article about hanging picture collages on the wall. I didn't really have a collage I needed to hang but I did have a hanging project that involved hanging 3 pictures in a straight line. 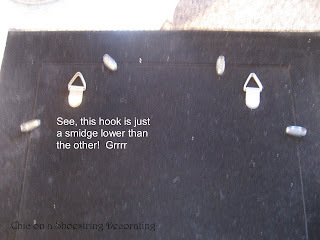 Each picture had not one, but two hooks on the back and the hooks of course were uneven. I was dreading this little project because I knew I would need to do it the hub's long way, with a tape measure and level and lots of little holes in the wall with no nails in them. I was going to put this handyman article to the test. First, they suggest cutting out large pieces of brown mail wrapping paper the same size as your pictures. Because I was too lazy to walk in the basement and get my brown paper, I just used the newspaper that was already in the kitchen, it worked just as well. 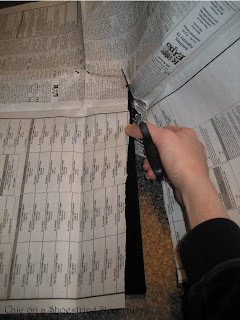 Then I made holes in the paper at the hooks for easy nail placement. Then I found the center of the wall (yes, I cheated and used a measuring tape) and taped the first paper there. I then hung the other two with tape. After I made sure it looked straight and level I hammered the nails through my pre-poked holes. Ok, I have to admit, the first two went up like a charm but the last one was off by a smidge...dang it! Somehow the last one was up higher on one side but I think it was my sloppy nail hole poking along with the uneven hooks. Thanks for stopping by, please leave a comment and follow me. I heart my followers!! Wow! What a great tip! I'm an eyeballer too so like you, I often have an extra nail hole (or two)... ; ) I've read a few issues of that magazine and you're right...definitely some good things to find. Thanks for sharing! looks great.. thanks for the tip. I'll be trying this soon over my bed. where did you get those frames? 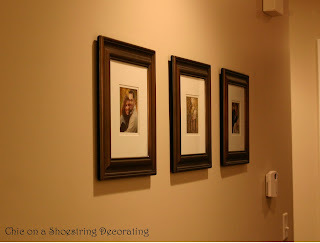 i finally ordered some pictures from ryan, and this is EXACTLY what i want to do in our hallway! maybe you can come do it for me...hehe! I love the pictures:) Who did them! Great tip!!! I am also an "eyeballer" and my hubby wouldn't find just one or two extra holes, LOL! Oooh I totally needed to see this. Pictures with two hooks on the back are my Nemesis!!! Thanks for the tip! Wow. Wow! Pure genius! 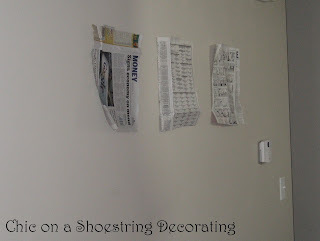 I will be doing this next time I hang anything! Thanks!!! I use this same trick when hanging groupings. And I LOVE Family Handyman magazine!